A magnificent and architecturally imposing royal residence which, as was the intention of Charles Bourbon, King of Naples, is as sumptuous as the Palace of Versailles. We set off from the port of Salerno by coach towards the Palace of Caserta, a magnificent historic residence that belonged to the Bourbon royal house from Naples. This UNESCO World Heritage site is also one of the most visited sites of Italy's rich artistic heritage. It owes its construction to Charles Bourbon, King of Naples who, struck by the beauty of the Caserta countryside and wishing to give a seat to the government of Naples and his kingdom, wanted a palace built here that could stand up to comparison with Versailles. The design, which was entrusted to Luigi Vanvitelli, was approved by the king in 1751 and the construction work began on 20 January 1752 when the first stone was laid during a solemn ceremony in the presence of the royal family and with squadrons of cavalrymen and dragoons deployed to mark the perimeter of the building. In addition to the palace, the king requested that the design include the park and the arrangement of the surrounding urban area, with the provision of a new aqueduct. The royal palace is surrounded by a large park, three kilometres in length. 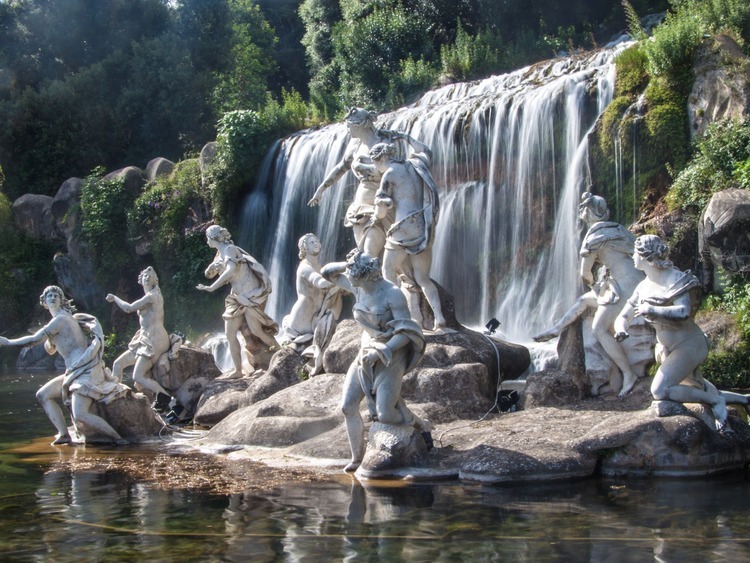 It is divided into two sections: the Italian garden with various fountains and the famous Grand Cascade, and an English garden with dense woodlands. At the end of our fascinating guided tour of the palace's interiors which will allow us to see its majestic rooms at close range, we'll have enough free time to visit the park, considered to be one of the most harmonious architectural creations in the world, independently.